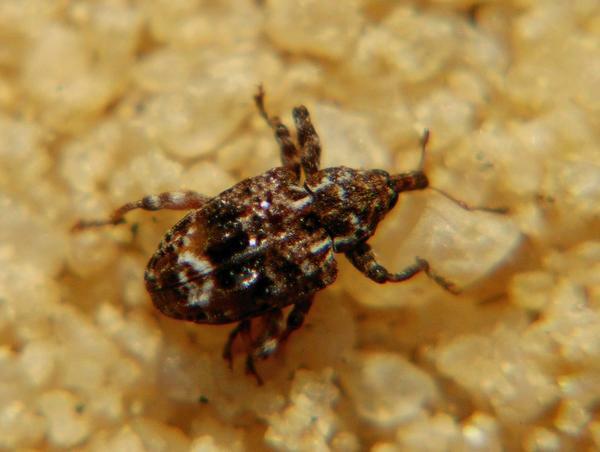 Plum curculio (Conotrachelus nenuphar; PC) are weevils (snout beetles) that are native to North America and occur from Canada to Florida and west to central Nebraska. 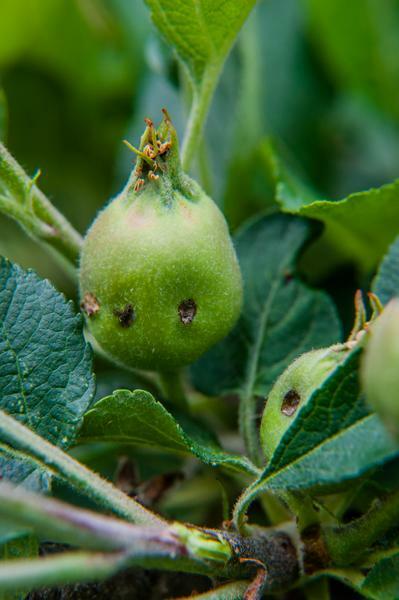 Historically, they were sporadic pests of apples in western North Carolina, but in recent years they have become a significant problem in some orchards. In addition to apple, PC will attack peach, plum, cherry, and blueberry. PC adults are approximately 1/4 inch (6.5mm) long, with a curved snout about one-third of the length of the body. 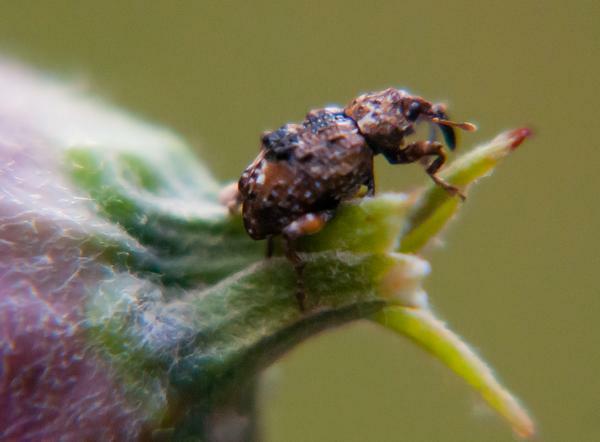 The body itself is warty and brown-gray with patches of white, and there are two bumps on each wing cover that help to differentiate PC from other common weevils. When disturbed, adults fold their legs close to their bodies and remain motionless. (In this posture, their strong resemblance to bark or debris makes them extremely difficult to detect.) 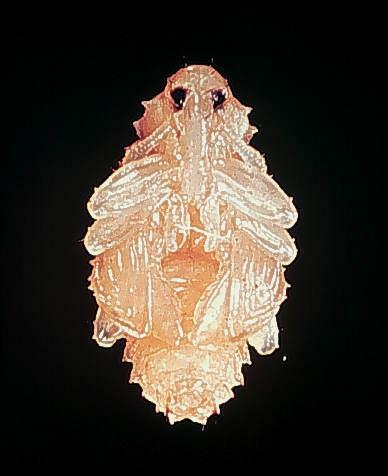 Full-grown larvae are 1/3 inch (7.5mm) long, legless, and white with brown heads. 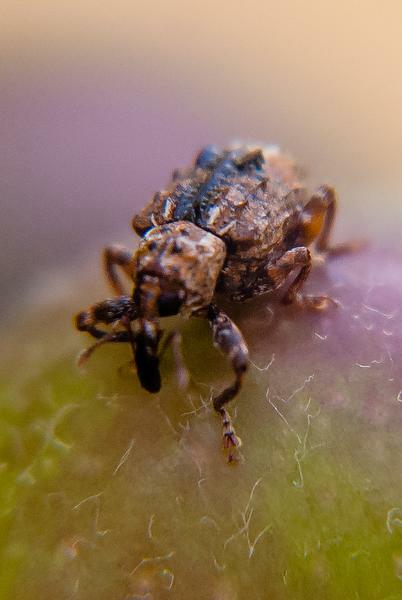 Plum curculio adult and larva. 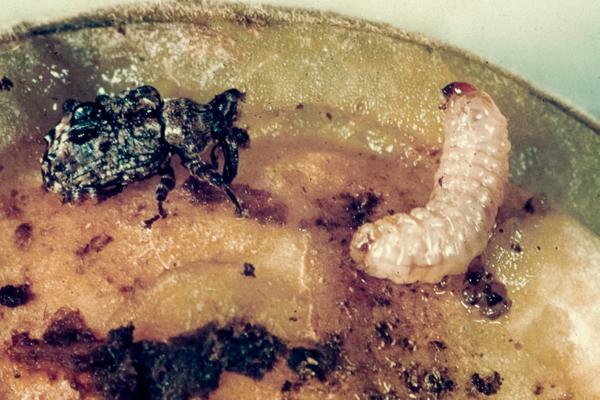 Adult PC overwinter in leaf litter in and around orchards. In the spring, when the daily maximum temperature exceeds 70°F (near bloom or petal fall), adults emerge, mate, and lay eggs under fruit skin. Depending on weather conditions, new adults can continue to enter until at least the first cover spray. Eggs hatch within a few days of being laid and feed in the fruit. First generation adults usually emerge about 8 to 10 weeks later. There are two generations per year in most areas of the Southeast, but only one generation occurs in higher elevations of the southern Appalachians. A female PC uses her snout to cut a crescent-shaped slit beneath each egg she lays in order to keep the growing apple from crushing the egg. 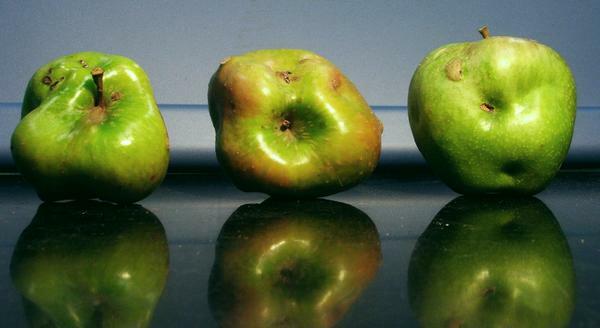 This slit becomes a crescent-shaped scar as the apple grows, though the damage is often only cosmetic. However, larvae sometimes bore tunnels, and heavily-infested fruit may become knotty or fall to the ground. 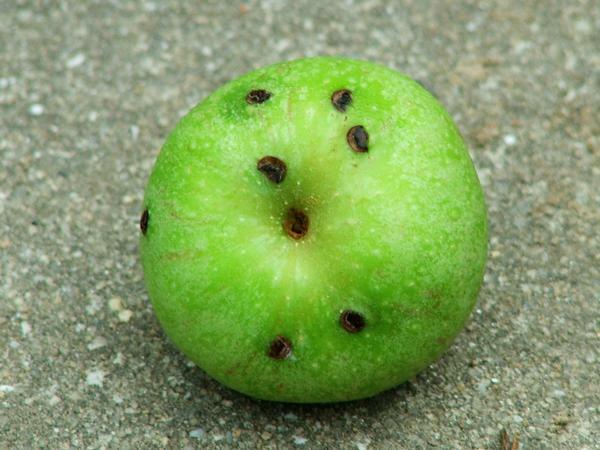 Later in the season, adult beetles may create numerous round punctures in fruit skin. 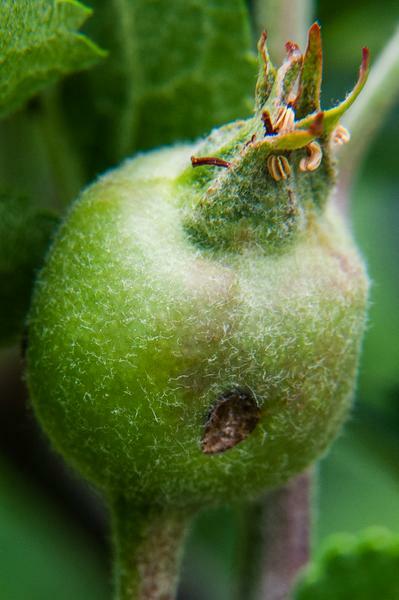 PC damage on young fruit. 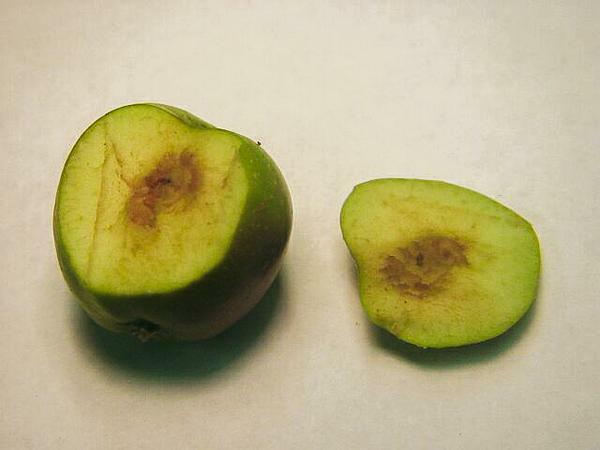 PC-damaged fruit, showing crescent-shaped slits. Scar from early-season PC damage. 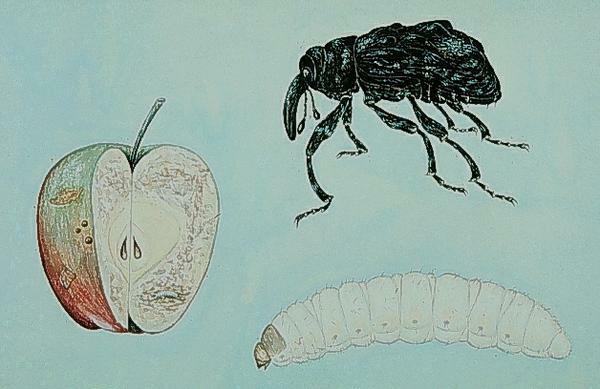 For detailed information on insect emergence times, degree-day calculations, and the most current control practices (including mating disruption and recommended insecticides), read the "IPM Practices for Selected Pests" and "Relative Effectiveness of Insecticides and Miticides" sections of the Integrated Orchard Management Guide for Commercial Apples in the Southeast. 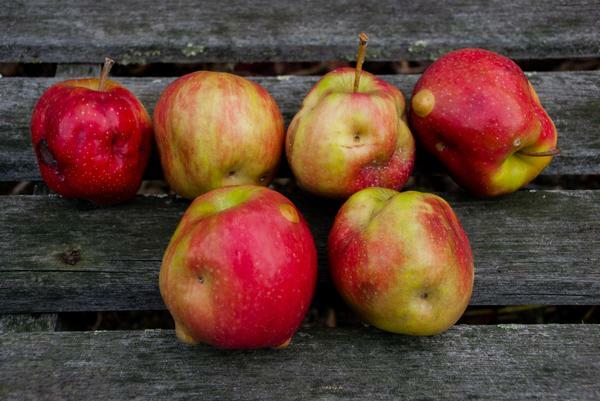 PC activity is correlated with weather conditions after bloom: infestation tends to occur the first day after petal fall when high temperatures exceed 70° F. After bloom, check fruit twice weekly for feeding and egg-laying scars. 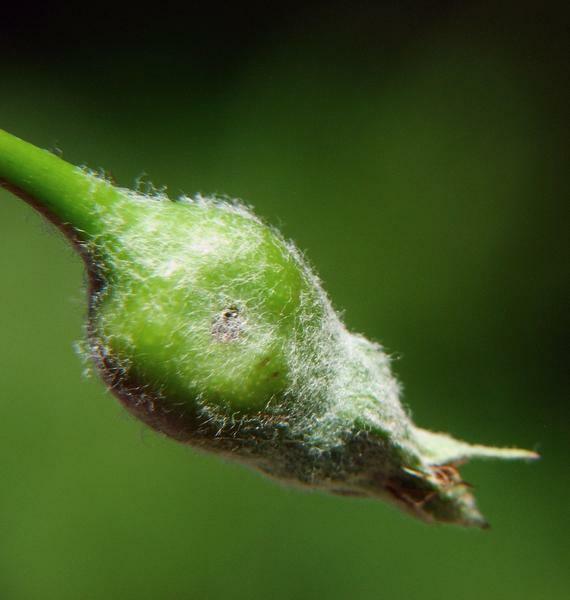 Typically, an insecticide at petal fall and first cover (if adult emergence is protracted) is used for control. 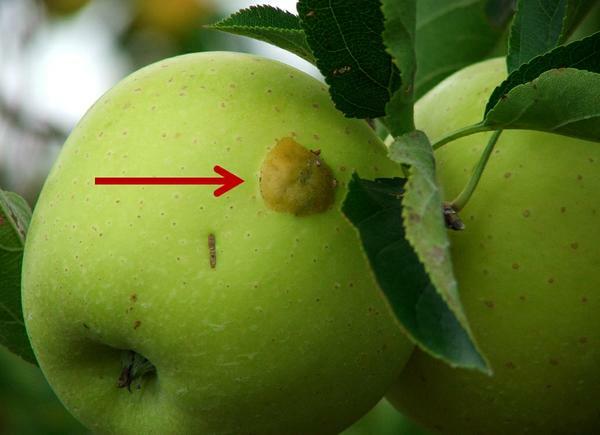 However, second generation adults emerge and can damage apples from late June through July, depending on location. Additional insecticides should be applied if any new damage is observed.